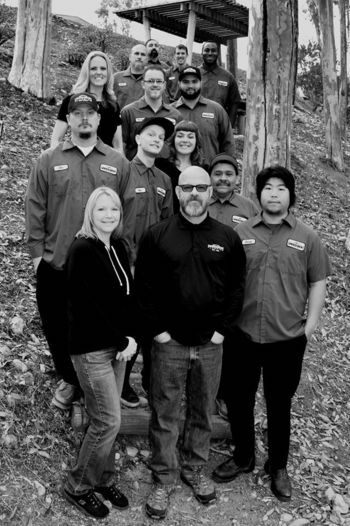 our San Diego plumbers are standing by and eager to get your plumbing into the finest shape attainable. 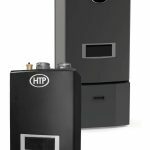 If you need water heater repairs, replacement, or water heater installation services for either traditional or tankless water heater systems, our expert plumbing staff can do the job! When it comes to getting your plumbing inspected or water heater flushed, we are the best company for the job. Contact our plumbing inspection and water heater flush experts today! 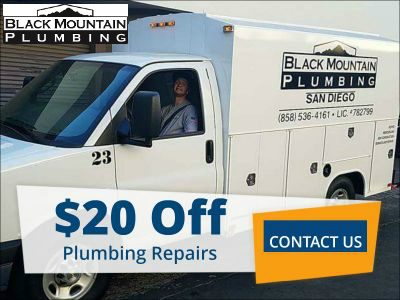 Black Mountain Plumbing, Inc. offers residential plumbing services and plumbing repairs in most of San Diego and the surrounding area. Our qualified residential plumbers can help you with all of your plumbing repairs, plumbing installations and plumbing maintenance needs. We are licensed by the State of California and have served the area for over 25 years. Our San Diego plumbers provide commercial plumbing services in San Diego and the surrounding metro area. From commercial office build-outs to commercial tenant plumbing services, Black Mountain Plumbing, Inc is your commercial plumbing company.We have the knowledge and equipment required to tackle your commercial plumbing disaster, while minimizing interruption to your workplace. A Commitment to Excellence, Quality and Integrity in Everything We Do. San Diego Plumbers – Black Mountain Plumbing, Inc. Welcome to our website. We are experienced, licensed plumbers located in the Scripps Ranch area. We specialize in bathroom and kitchen remodeling, commercial and residential plumbing, plumbing repairs as well as water heater repair and installation, tankless water heaters and a full line of water softener and filtration systems. We offer plumbing inspections and diagnostic services to prevent and find your plumbing problems. 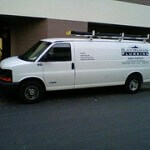 We are your source for plumbing and rooter service. 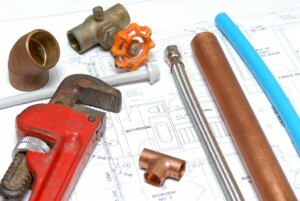 For more information on the services we provide as plumbers in San Diego. We strive to be the best plumbing business in San Diego by offering excellent customer service and are proud to receive the Angie’s List Super Service Award every year since 2005. Less than 5% of all plumbers listed on Angie’s List are eligible to receive this award. We are members of the Better Business Bureau and have an A+ rating. 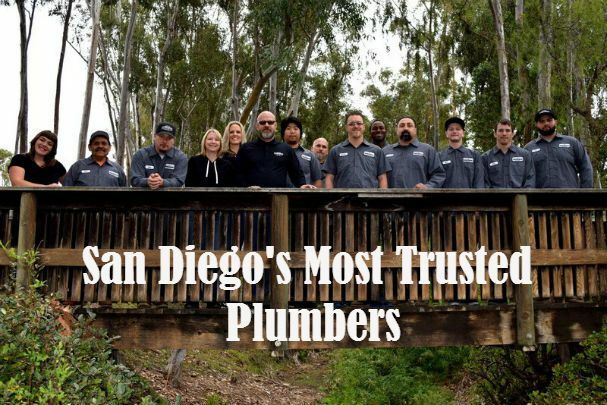 We are also members of the Plumbing Heating Cooling Contractors Association and were named “best Plumber in San Diego” by Mojopages in 2012 and 2013. Find out what others have to say about us click here. Spice up your bland bathroom with these bathroom renovation ideas. 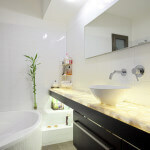 A bathroom renovation can be life changing. Dear Black Mountain Plumbing: This is to compliment your employee who gave us excellent service in all facets of his job. He arrived on time, worked skillfully, and did his best to provide me with a satisfactory outcome.I was inpressed with his enthusiasm for his work, the pleasure he expressed in a job well-done, and his professionalism. I especially want to express my appreciation for all he did to attempt to make my poor-quality faucet operational, trying several different approaches. When that didn’t work, he contacted a supplier to try to obtain the specific type of faucet I wanted. The final result, while not being exactly what I had in mind, was very good, and will give me years of excellent service, I’m sure.I am confident that if I have a plumbing need at some future date, I will not hesitate to call upon you again. 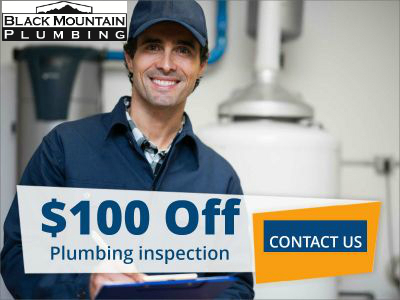 I am writing to tell you how much I appreciate Black Mountain Plumbing’s service via your employee. He was a super and polite repairman. Did a fantastic job on our bathroom sink repair.Thank you.” Sharon W. Go to our review sources page to write your own plumbing reviews.. “Thank you for the work that you did to replace the tub in our master bath. It was a big & difficult job from beginning to end. However, with your expertise and that of your team of workers, it was completed without any problems for us. You were easy to work with, and the efficient clean up at the end of each day was very much appreciated. Best of all, I now have the use of my new tub and will thoroughly enjoy the relaxing experience. If there is ever a need that requires expert plumbing service, I would not hesitate to call you again or recommend you to a friend. We appreciate the excellent work you did on our copper repipe. We had a leak in the Quest pipe and have taken a year and a half to finally find a reliable plumber. You and your crew were courteous, friendly and fun. You took the initiative to correct other issues without adding additional costs to the project. The work was completed in a timely manner and we appreciate all of your helpful advice and excellent referrals. You were correct when you stated ‘We will be your plumbers for life.’ Thank you for your professional assistance and we look forward to working with you in the the future. Please feel free to use us as reference. I would like to compliment the plumber who installed our toilet. He was on time, efficient, courteous and knowledgeable. Thank you for sending such a helpful gentleman. Now that our house is back to normal, Sean & I are thanking all the hard workers who fixed it all. You deserve a BIG THANKS for going above & beyond the call of duty — working with the hot dehumidifiers, cutting your head and actually bleeding, troubleshooting all the extra projects I kept throwing at you, assessing the cause of the leak in our son’s toilet while you were downstairs fixing the MAJOR problems in the kitchen sink. Oh yes, I can’t forget how you stayed an extra half hour (after putting in over 8 hours at my house) to help me with my broken garage door! Wow! You are the BEST & we are very, very thankful & grateful to Black Mtn. Plumbing for sending you our way (AND GOD, too, of course.) As much as we love you & the excellent work you do, we hope to never have to see you again — HA HA just kidding!! As last month taught us, life happens, when it does — we’re calling you!! Take care & GOD BLESS! Thanks for the excellent service you provided my friend Jill Steiner today. You were so prompt, effective and informative. It’s hard not to be really distressed when water starts flooding through the ceiling. Having you take action right away really brightened Jill’s day. If you’ve ever tried to go to sleep with a dripping faucet in the next room or wrestled with a kitchen sink that didn’t that dripped through the night, you know how irritating this common a problem this can be. A dripping faucet also drives your water bill higher. 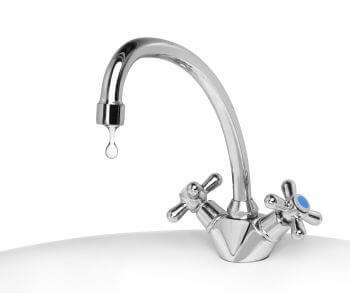 A single faucet can waste hundreds of gallons of water a literally sending your hard earned money down the drain. Water entering your house is under pressure to move it through the pipes. When you turn off the tap, rubber or silicone-based washers form a water-tight seal that prevents more water from pressing its way through the pipes and out of the faucet. Over time, washers can become stiff, torn or worn, enabling a small trickle of water through and producing that bothersome drip. While you can replace washers yourself, the repair work task can be more of an obstacle than you might anticipate without specialized devices. If the leak has actually gone on for a extended period of time, the valve seat may become worn or rusty, demanding a more engaged repair that’s best left to a plumbing professional. When the water that enters into your sink, tub or toilet won’t head out, you probably have a partial or total clog. In a lot of cases, your reliable plunger can fix the problem. Plungers utilize air pressure to dislodge a clog, but they can’t remove it totally. Commercial drain cleaners and clog eliminators are safe for the majority of drains for periodic usage, but these caustic products can damage some pipe materials if made use of too often. 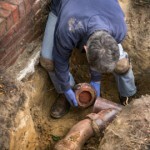 If you’re dealing with drain obstructions on a regular basis, it’s time to us. Even if you do not have a total clog, particles in pipes can slow drainage to a drip. Shine a flashlight into the drain and see if you can spot the issue. A pair of pliers or tweezers might be able to reach a clump of hair or fallen bottle cap that’s obstructing your pipes. Install drain screens to prevent hair or sediment from finding its way into the drains. Sometimes you may hear your toilet start to spontaneously fill up, as though somebody had actually flushed it. A toilet that cuts on and off by itself, or runs intermittently, has an issue that plumbing contractors call a running toilet or a phantom flush. The cause is an extremely slow leakage from the tank into the bowl. Do you realize that a running toilet can squander approximately 200 gallons daily? That’s a great deal of water waste! Many home owners go months, if not years, without having this concern fixed or perhaps given a look at by a professional, licensed plumber. What you need to know is that a running toilet is an internal water leak. For that reason, if you neglect the issue this might increase your water bill due to the gallons of water being squandered daily. So why exactly do some toilets run? There are a handful of reasons why this can happen to some toilets and not the others. The toilet flapper could be worn out, the chain linked to the flapper could be inadequate, or the toilet tank float ball and float arm could be working incorrectly. 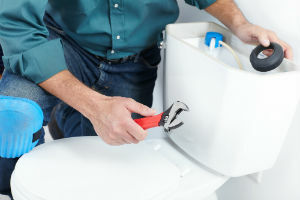 The tank of the toilet is rather intricate, so it’s constantly best to have a licensed and knowledgeable plumbing professional identify and repair the issue.